This building was designed by the architect Luis Aladrén, at the end of the 19th century. Eclectic in style, the formal characteristics of this building show a preoccupation for the composition of the facades and its external appearance. The predominating characteristics of this style are its overelaborate decoration and ostentation. This building is a perfect example of the late 19th century monumental eclectic style. 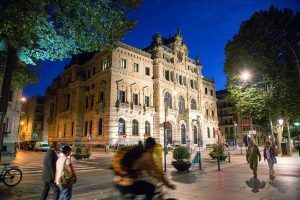 It is one of the most emblematic buildings in Bilbao and the province of Bizkaia. It stands on the Gran Vía.